actually manage to make it work on time. (Why do I announce this to the Winds of Fate? road I heard the laughter. It was Fate. There, by the highway, were two loose horses. called the office and informed them that I would be, yet again, late. They didn't seem surprised. * "Sorry I'm late, the goats got out again!" my ankle. Now I can't get my boot on." * "Hello? Yes, it's me. I'll be late again. I have to bury the old barn cat." * "Yes, I need to leave early. Apparently my dog is in heat." * "I have to take tomorrow off. I need to pick up hay in the field." * "Yes! It's me! Late! Again! (huff puff huff puff) The ponies just got out and I had to run them down." * "No, I won't be home on time. Some guy jumped off a building." hasn't picked up my dead guy so I'm gonna be late." * "Would you check on my pregnant goat? A dumptruck just squished some guy's head. I'm gonna be here a while." Lily?!?!?!? What happened? After a minute of freak out, I see she looks younger than her year old now. So what happened?! (note the less freaked out signage) Couldn't have been too hysterical since it's the cutest vetwrap this side of Houston! Lily broke her leg when she was 4 or 5 months old because she was leaping to bite at the horses in their stalls. Her skinny little leg slid between the boards and she broke it in two places! 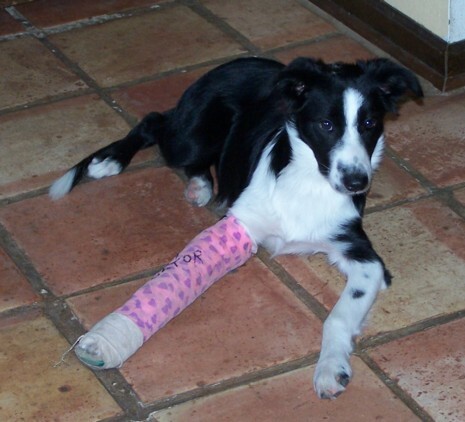 Good luck keeping a Border Collie puppy in a cast quiet!